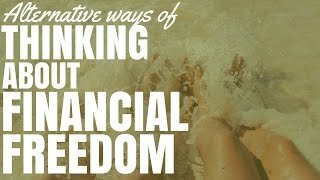 Many people get stuck thinking about financial freedom in a non-productive way. Here are some alternative ways to think about financial freedom. Today, I wanted to talk about some alternative ways of thinking about financial freedom and kind of poke the box of what we think financial freedom needs to mean for us and what the ideal lifestyle needs to mean for us. I used to be in the basket of the person who thought that in order to be happy, in order to feel successful in life, I needed to be extremely rich. And I would set goals for myself like, “This year, I’m going to make a million dollars.” and I had in my mind that if I made a million dollars, then I would be successful and I would be happy. And if you’re thinking that way, then look, that’s absolutely fine. A lot of us go through that phase. A lot of people always want that, but there are some alternative ways of thinking about financial freedom that I just want to challenge you a bit with today to start thinking about, okay, what is really important in my life? What do I really care about and what do I really want? Let me take you back a few years. I think it was October 2010, so it was about 5 years ago and I’m just going to bring it up. If you go ahead and Google “why I will be financially free in 5 years” let’s see if I come up. Okay, ryanmclean.net should come up. If not, you can just search for “Ryan McLean” as well. This is a post that I wrote 5 or 6 years ago now. It’s a very cocky post that I wrote when I was… How old was I? I must have been 21 when I wrote this, so maybe it was more than 5 years ago. I have the crazy dream ambition to become financially free in 5 years. So I planned on being able to retire by the time I’m 26. So, I’m 28 now. So, this was probably 6.5 years ago that I wrote this. Basically, I go through this post and I talk about why I’m going to be financially free. Why I’m so awesome and it’s actually quite embarrassing to read through this, but I think what’s really valuable is at the end; point number 7, I talked about one of the reasons I’m going to be financially free is I know my “Why”. And there’s this one sentence where I wrote: So I can have as much free time as I want to spend with my family. And so I can have a platform for which to speak into people’s lives. And at the time, and still now, those are probably the 2 most important things to me. They’re my family, being able to spend time with my family. Being able to see my kids grow up, being able to be a part of that. I had a stay-at-home dad when I was a kid and he was really involved in me and my sister’s life. And that’s something that I wanted to emulate and something that I wanted to do as well. And then, also, I wanted to, I guess, do some good in the world and I really love communicating, I really love speaking. And so, I wanted to be able to have a positive impact in people’s lives. So, back 6.5 years ago, I thought about this. And then, when the 5 years came around, I wrote an updated post on how I’m not currently financially free, but looking back, I realised that I had achieved my “Why”. Because the situation I’m in at the moment is I run my own online marketing business. I run a multitude of websites – one of them being OnProperty, which you guys are listening to now. I’m not financially free. However, I work for myself, I get to spend a lot of time with my family and I also have a platform to speak into people’s lives. So, they’re the 2 things that were important to me. Basically, what I want to challenge you with today is that financial freedom may not be what you think it is. Because we think about financial freedom in the terms of what it means. If we are financially free and not tied to a job, that we have investments that pay us passive income and we’re then free to do what we want with our lives. However, that can be a really constricting idea if you take it as that. You can say, “Okay. I can only do what I want with my life once I’m financially free and no longer tied to a job.” And you get yourself in a position where you’re not living the life you want now because you’re so focused on financial freedom. And then you can get distracted and it can take you longer than expected. Whereas, I took a very different path and I’m not saying that everyone should do this, but I took a different path where I went out and I wanted to do the things I wanted to do and I kind of made them fit into my life without financial freedom. When I fast forward and I’m 80 or 90 or 100 or 200, given technology, and I look back on my life, I really feel this deep sense of my family. My wife and my children as well as my sister and my parents and my family, like my mother-in-law and all that sort of stuff. That’s really important to me. As well as grandchildren, all that sort of stuff. So I think about the one thing in my life if I look back that I’m going to be most proud of is my children. The second thing that I think about is what positive impact did I have on people’s lives? What people were I able to help? What good was I able to do in the world? This activity can really help you to understand that, okay, well, was seeking after financial freedom, we’ve been told that we’re going to be happy when we have a Porsche and we have a multi-million dollar mansion on the beach and we’ve got 7 cars in our garage and our own private jet and all of this massive property portfolio. We tell ourselves that this is what we want to be happy. This is what we want to be fulfilled, but then if you do this activity and you fast forward in your life and you look back and you say, “Okay, what is actually important to me?” Do you actually care about owning a Ferrari or owning a Tesla or owning a house on the beach? And the fact is, I don’t. And that’s not for everyone, some people do care about that sort of stuff, but for me, I don’t. So, one thing I want to challenge you with the first thing is that when it comes to financial freedom, it may not be as expensive as you think it is. The idea that you have of a financially free life right now might not actually be the ideal life for you. It might not be the happiest life for you. Because for me, if I was financially free and really rich, but I didn’t see my family a lot or I missed my kids growing up because I was focusing on achieving financial freedom, then that would be a loss to me. I always thought if I was successful in business, successful financially, but my marriage broke apart, well then, I’m not a successful person. So, you really need to weigh up what do you need in order to be financially free and is the life that you have envisioned for yourself actually what you need to be financially free? The more that I explore this idea and the more that I thought about this idea, the more I came across concepts like tiny house living and minimalist living and not having as many things. I’ve got this great art that hangs on my walls that says, “All I need less” or “All you need is less” or something like that. I can’t remember. We’re packing and we’re moving, so it’s hidden away at the moment. But that’s just a reminder to me that I don’t need a lot of things. We love tiny house living. We love the concept of living small. Living in close quarters with each other so we can enjoy each other’s company. But then, also, just living smart and having a good impact on the world. I’m a vegetarian, heading towards vegan as well, so don’t judge me for that. As me and my wife explore this idea of okay, the Porsche and Tesla in the garage, multi-million dollar mansion, that’s not really what’s going to make us happy. Let’s explore some cheaper alternatives. Then we explored tiny house living or converted shipping containers into houses. Living more rural. Living on the Gold Coast instead of Sydney. The second part of this that I want to get across is that financial freedom is not the be-all and end-all. Obviously, financial freedom is meant to allow us to then go and do what we want, but I would encourage you to explore how you can do what you want in your life anyway. I was working in a 6-figure job. High, stressful job in sales and I ended up quitting that job. Moving into state with my 2 children at the time, now I have 3. And I went into business for myself and my business at the time was earning about $1,000 – $500 to $1,000 a month. So, I took a massive risk there, but it was really important to me, as we looked, when I was 80 or 90, to have a positive impact on people’s lives and I felt like the work that I was doing wasn’t necessarily being appreciated and I wasn’t having the biggest impact I could. This, I want to try and so, I went ahead and went after it. And people say well, what about the risk? Not everyone can do that. Obviously, there are some risks. I had 2 children, I had a wife to feed who wasn’t working at the time, she was looking after the kids. And so, there was risk that we would lose some savings there, but there’s always the option to go back to work. And now, 2 years on or 2.5 years on, I’m in the position that, let’s say business fails for one reason or another, I have some pretty valuable skills in terms of online marketing, in terms of communicating that I could easily go and find a job somewhere else. I wouldn’t even have to go and seek or career whatever those websites are, I could go to business and say, “Look, here’s what I’ve done with my own sites. Let me help you.” And I could get a job that way. So, there are risks, obviously, in going out and trying to do what you want and you need to weigh all of these sorts of factors because you don’t want to end up homeless and things like that. But for me, there was a risk, but I could always go back and get a job. And now, the risk has paid off because I’ve developed my skills and I’m more valuable in the marketplace. So the risk gets less and less everyday as my business gets more successful. But as well as I get more proficient at what I do, if the business does crumble, I’m a more valuable person that I could go and get a job. I just want to encourage you to think alternatively about financial freedom in terms of how much money you actually need to be financially free. And don’t get locked in the same mindset that Ben Everingham from Pumped On Property was locked in. He wanted to earn I think it was 4 times his salary through a side business. Plus, he wanted to have $100K passive income from his property portfolio before he quit his job and live the life of his dreams. I just said to him, “Dude, looking at your portfolio, you’re already financially free. You could quit and you could do whatever you want. You don’t have those risks.” And he was like, “Oh, yeah. You’re right.” So he had this idea in his mind of what he thought he needed to achieve, but realistically, he didn’t need to achieve any of that. So, I just want to encourage you to be careful not to get stuck in that same trap where you’re searching for something or you’re reaching after something that may not be achievable or you just don’t need to achieve. Sometimes, less is more. And you can have a happy life with less and you can achieve everything you want to achieve like I did in my 5 years. So I can have as much free time as I want to spend with my family. And so I can have a platform from which to speak into people’s lives. So, I thought I needed financial freedom to achieve those 2 things, but I found another way to achieve it. I hope that this encourages you today. I hope that this gives you some alternative ways of thinking about financial freedom and thinking about the goals that you’re going after. Investing in property can be great. Generating passive, obviously, great. Getting that security, obviously, great. But, I just want to warn people and encourage people to just not seek after something that they’re going to get there in the end and they’re not going to be happy or something that’s too hard to achieve that they sacrifice the things that are actually valuable on the way to getting there. Then they get there and they find that they’re miserable. So, I wish you the best of luck in your property journey. I wish you the best of luck in achieving the goals that you have for your life. And until next time, stay positive.